On 11 November 2016, CEPIS and the Hellenic Professional Informatics Society (HePIS) organised a European e-Competence Framework (e-CF) briefing in Athens, Greece, as part of the IT Professionalism Europe (ITPE) series of events on the e-CF. The event gathered 20 representatives from industry, such as Microsoft, ActionAid Hellas, Career Builder and Ulysses Systems. 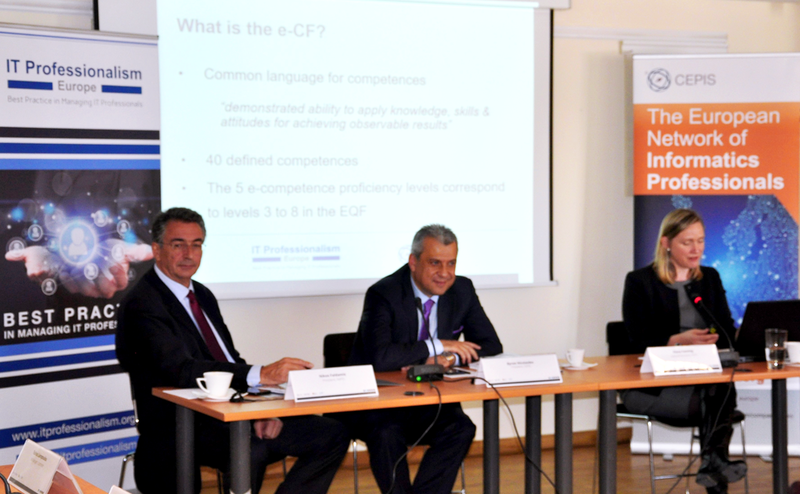 The briefing revealed a significant appetite to learn about the e-CF and discuss its potential to provide a common language to describe the competences, skills and knowledge requirements of ICT professionals. ITPE’s Fiona Fanning introduced the e-CF, providing the context that had led to its development and detailing the work done by the CEN Workshop on ICT Skills and the CEN Technical Committee. She explained that it was designed to meet the needs of both public and private organisations, and gives clear definitions to support decision-making with regards to the selection and recruitment of candidates, as well as the training and assessment of ICT professionals. The methodology used to develop the e-CF was also explained. Fiona Fanning explained that the e-CF is not based on job profiles, but rather focuses on the competences needed to develop, operate and manage ICT projects and processes, to exploit and use ICT, to make decisions, develop strategies, and to foresee new scenarios. As attendees expressed an interest in the practicalities of e-CF usage and application, pragmatic examples of the e-CF in action, from both an industry and an education provider’s perspective, were provided. The competences provided by the e-CF can be used as “bricks” for building job profiles. The availability of pre-prepared descriptors is of significant benefit to any profile builder. It allows the profile builder to avoid starting from a “blank canvas”. The modular structure of the e-CF supports the mixing and matching of competence components, and provides clearly articulated statements for a broad range of ICT specialist roles. In addition, the e-CF allows organisations to match education supply with market needs. It is an efficient way of connecting companies to schools, universities and training institutions. It demonstrates industry competence needs, thus informing educational and training institutions when they design programmes, and supporting mutual understanding and communication between them. As a consequence, it is easier for qualification providers to match the requirements of employers and the labour market. It is also easier for organisations to articulate their needs. Fiona Fanning also presented the CEPIS e-Competence Benchmark, a free, online interactive tool, powered by the e-CF, which enables current and future ICT professionals to identify the competences they need for various ICT roles and career paths. It helps individuals plan their career development and make an informed decision about further education.